This section deals with getting fresh, outdoor air into your home's interior space. We have experienced cycles where public (and professional) opinion have varied over time. As we became focused on energy costs in the two OPEC embargoes of the 1970s, weatherization and insulation of buildings became active to reduce energy use and the growing utility bills that resulted. Conservation was catching on by necessity, even if Ronald Reagan defined it as "freezing in the dark." Solar energy utilization and design began to take off, shaking its former reputation as something that only kooks and hippies cared about. And while this focus on "tightening up" our homes intensified, designers of commercial office space continued to find new ways to lower infiltration to reduce heat loss. In people's homes, this effort could be tempered with the manual opening and closing of windows as necessary. But commercially, there were problems. 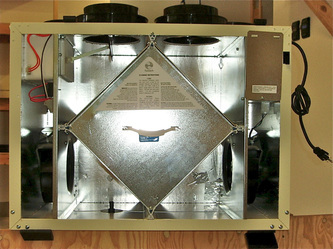 There had been long-time historical standards and attention to fresh air introduction to public buildings based on occupancy by HVAC professionals like ASHRAE (The American Society of Heating, Refrigeration and Air Conditioning Engineers). Certain fresh air minimums for incoming cubic feet per minute were long understood. But as building designers attempted to do more to reduce the size of HVAC equipment by insulation, daylighting, and tightening against infiltration— people began getting sick in mysterious ways. One of the more memorable examples was the late 70s construction of the California Energy Commission's Sacramento Headquarters. For a time, building managers were reluctant to look at anything other than off-gassing building materials, paint, and the like as the reasons people were getting sick. By the time the full investigation was over (after much absenteeism and some transfer requests) inadequate ventilation was identified as the main culprit. Inadequate lighting was also suspected as a contributing factor. Today the building's ventilation has been corrected, and designers are more cautious about adequate fresh air. And fresh, incoming air has to be heated or cooled, so there is an energy consumption trade-off for health inside public buildings. In truth, our own homes have faced worse problems— smoking, cooking with gas, cooking fumes, pet hair, etc. What to do? In the 1980s, air-to-air heat exchangers were developed. 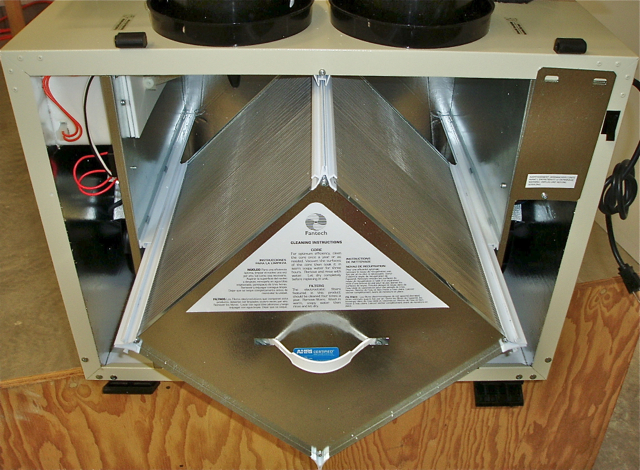 Presently, these are known as HRVs or ERVs (Heat Recovery or Energy Recovery Ventilators). They blow interior poor quality air outside while importing fresh outside air into the space. What's different from opening a window? In the case of HRVs, the two airstreams pass by each other, separated by a thin (usually metallic) membrane where they exchange some of their differences in temperature with each other. And while this air exchange is going on, "tight house" or not, it's just about impossible to suffer un-tempered air infiltration from the outside to the inside. 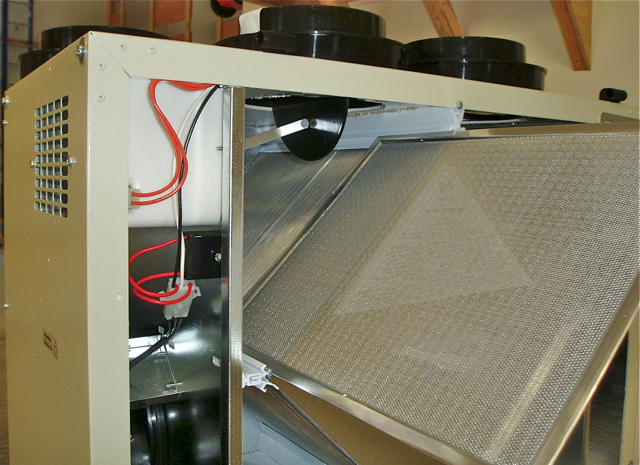 HRVs can be ducted simply as fresh air delivery systems or as integrated with a conventional HVAC system. 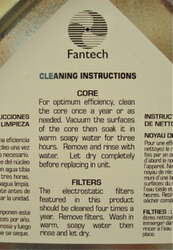 Notice the similarities in both systems' stale air collection from kitchens and bathrooms. A typical HRV device. Use an operations timer and you don't have to work against the outside air that's the daily coldest or hottest in winter or summer. 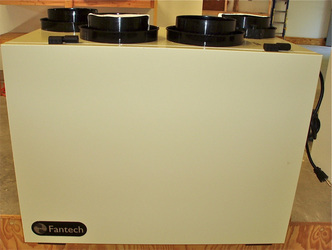 This is a vertical discharge FanTech 2005R HRV unit that averages 62% heat transfer efficiency. 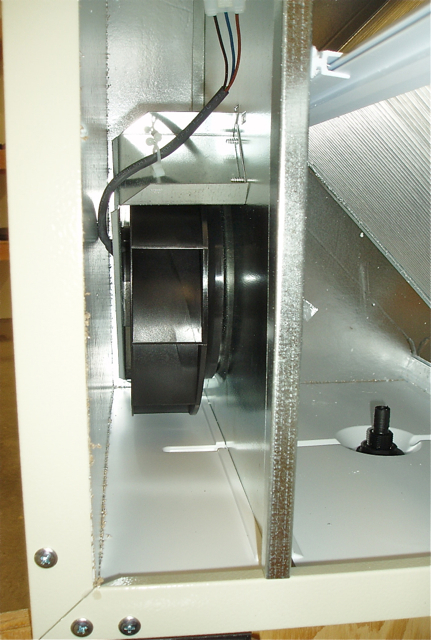 This installation will be tied by ductwork to the HVAC system (a 3-ton ground source heat pump). 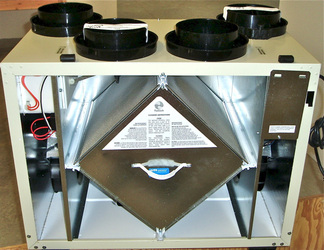 The "R" stands for re-circulation as a defrost circuit. When incoming outdoor air entering the HRV is cold enough to "ice" the heat exchange core, outdoor air is stopped and interior air is substituted. This means that interior warm air raises the HRV's interior until the temperature rises enough to re-admit outdoor air. This is preferable to heating the inside of the box with electric power. 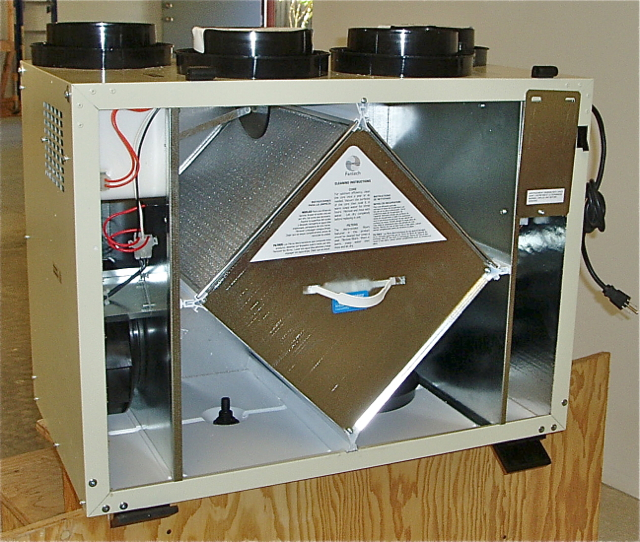 In the case of the unit below, the recirculating (defrost) duct run comes from the pantry ceiling. Entering outside air follows an incoming duct run from the home's north gable face, tucked under a 30" roof overhang. 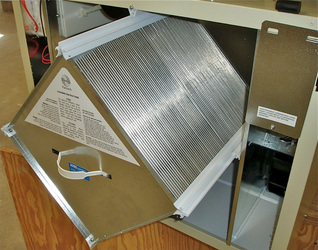 After passing through the HRV, this thermally conditioned air is joined to the main return air duct of the HVAC system where it is distributed through the supply air ductwork because the heat pump's fan is interlocked to the HRV (meaning that when the HRV is on, it drives the "fan only" function of the heat pump if it was not already operating). Interior air (to be exhausted) comes from ceiling grilles in three bathroom areas and the laundry room. It passes through the HRV's heat exchanger in close contact with incoming outdoor fresh air. The two airstreams trade Btus (at 64% transfer efficiency) as they pass through the heat exchanger. After interior outbound air exits the HRV, it is ducted out of the same north gable face as the intake air, but 30 feet away, and in a dominantly downwind location. Photo Gallery of Heat Recovery Ventilator's Interior. Click on images below for larger views plus caption. Use right arrow to advance to next image in close-up. They also come in larger sizes! A commercial, dual heat exchanger HRV unit, ready for installation. Not recommended for your home! This unit probably moves in the neighborhood of 7-10,000 cfm. Commercial buildings need not waste as much energy (or make people sick, anymore).